Mountain cabin w/ multiple decks, incredible views & pool table - dogs welcome! Property 1: Mountain cabin w/ multiple decks, incredible views & pool table - dogs welcome! Modern dog-friendly cabin! Great views, private hot tub, shared pools! Property 3: Modern dog-friendly cabin! Great views, private hot tub, shared pools! Amazing cabin with loft, new decks with hot tub overlooking Carters Lake! Property 4: Amazing cabin with loft, new decks with hot tub overlooking Carters Lake! Privacy with incredible views, short drive from ATL. Perfect for large groups! Property 6: Privacy with incredible views, short drive from ATL. Perfect for large groups! Property 9: Make beautiful memories and enjoy the nature all around you! The American Dream! Riverfront A-frame cabin w/hot tub. Float back to your cabin! Property 12: Riverfront A-frame cabin w/hot tub. Float back to your cabin! Shady River Retreat -- Your Riverside Paradise! Property 14: Shady River Retreat -- Your Riverside Paradise! Secluded country cabin w/ resort amenities like a shared pool, tennis, more! Property 17: Secluded country cabin w/ resort amenities like a shared pool, tennis, more! 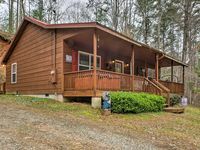 Property 18: Secluded & Luxury Ellijay Cabin w/ Hot Tub & Deck! Dog-friendly Coosawattee River Resort cabin with deck, hammock, & shared pools! Property 19: Dog-friendly Coosawattee River Resort cabin with deck, hammock, & shared pools! Peaceful Private Cabin, Hot Tub, Fire Place & Dogs Welcome! Property 20: Peaceful Private Cabin, Hot Tub, Fire Place & Dogs Welcome! Riverfront pet friendly very private cabin sleeps 10 with hot tub and fire pit! Property 24: Riverfront pet friendly very private cabin sleeps 10 with hot tub and fire pit! Luxury River Front Cabin Hot Tub, Large Game Room, Fire Pit by the River, WiFi. Property 26: Luxury River Front Cabin Hot Tub, Large Game Room, Fire Pit by the River, WiFi. Pay for 2 nights, get 1 free! 3/2 DEER Galore! Property 27: Pay for 2 nights, get 1 free! 3/2 DEER Galore! Riverfront! Wi-Fi, Hot tub, Gameroom! 7th Night FREE! 5 STARS!! Property 29: Riverfront! Wi-Fi, Hot tub, Gameroom! 7th Night FREE! 5 STARS!! River View From 4 decks/2 Game Rooms/Hot tub/Privacy/Pet Friendly/Kids Paradise! Property 32: River View From 4 decks/2 Game Rooms/Hot tub/Privacy/Pet Friendly/Kids Paradise! 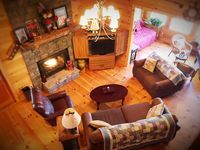 Cozy Blue Ridge Mountains cabin w/ private hot tub & wood-burning fireplace! Property 36: Cozy Blue Ridge Mountains cabin w/ private hot tub & wood-burning fireplace! Luxury cabin, tranquil, secluded, just minutes from town! WIFI Stone Fire Pit!! Property 41: Luxury cabin, tranquil, secluded, just minutes from town! WIFI Stone Fire Pit!! Beautiful 3 Bedroom/3 Bathroom Cabin! Perfect vacation cabin! Property 43: Beautiful 3 Bedroom/3 Bathroom Cabin! Perfect vacation cabin! Large, dog-friendly cabin w/ private hot tub, shared pool, and mountain views! Property 48: Large, dog-friendly cabin w/ private hot tub, shared pool, and mountain views! Mountain view lodge w/ a private hot tub, game room, & a shared pool, tennis! Property 50: Mountain view lodge w/ a private hot tub, game room, & a shared pool, tennis! Great Cabin with everything you will ever need - Kids had a blast! Just like all of the other reviewers this cabin is great! The kids had a ton of fun with all the games, tons of Disney and other VHS/DVD's, arts and crafts, and the hot tub was a huge hit. My dog had plenty of room as well. Two grills (gas/charcoal), plenty of balconies and decks. It rained and was a little too cold for us to tube, but we did wade out in the water some and fished a little. Overall is what a great cabin with no complaints. Great time spend there,wildlife was great,red birds,ravens Swallow nesting in cliff behind house,counld be seen from back porch.Rained while we were there could hear it on the tin roof .Also seen deer on either side of cabin.